The Sculpture by the Sea Exhibition in Sydney is about to celebrate its 20th anniversary. The exhibition aims to give the Australian public access to inspiring and thought-provoking art. However, the primary mission is to spread important conservation messages that will spark much-needed environmental change. And it’s the perfect platform to do this. Sculpture by the Sea is touted as the world’s largest outdoor sculpture exhibition. In fact, it’s estimated that a staggering three million people will attend the event this year. We were thrilled when we were approached by world-renowned artists Gillie and Marc Schattner to join forces to raise awareness of the plight of the rhino. 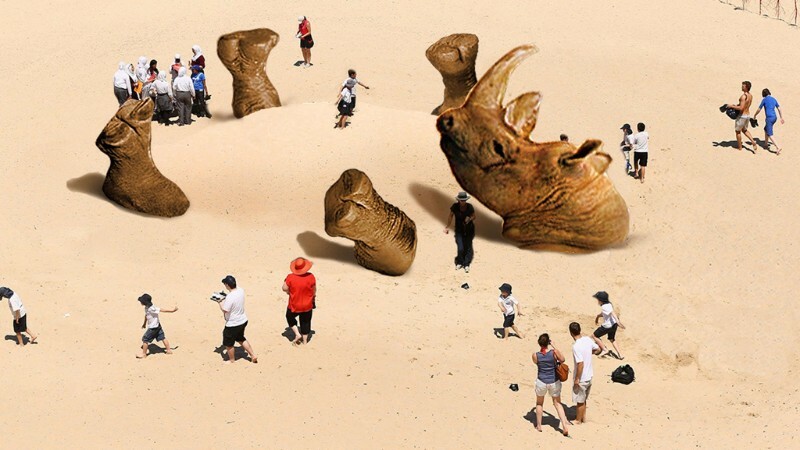 The artists have created the world’s largest rhino sculpture which they have named Shandu – meaning “change”. Shandu is an incredible five meters tall. He is upside down and buried in the sand, working as poignant reminder that rhinos are going belly up and if we don’t change things they will be buried forever. Needless to say, we were delighted to partner with Gillie and Marc. It is a monumental effort and we are incredibly proud to associate ourselves with these wonderful artists at such a prestigious event. So please head down to stunning Tamarama Beach and visit Shandu between October 20 and November 6— the imagery of this sculpture is very powerful indeed. The exhibition is free. 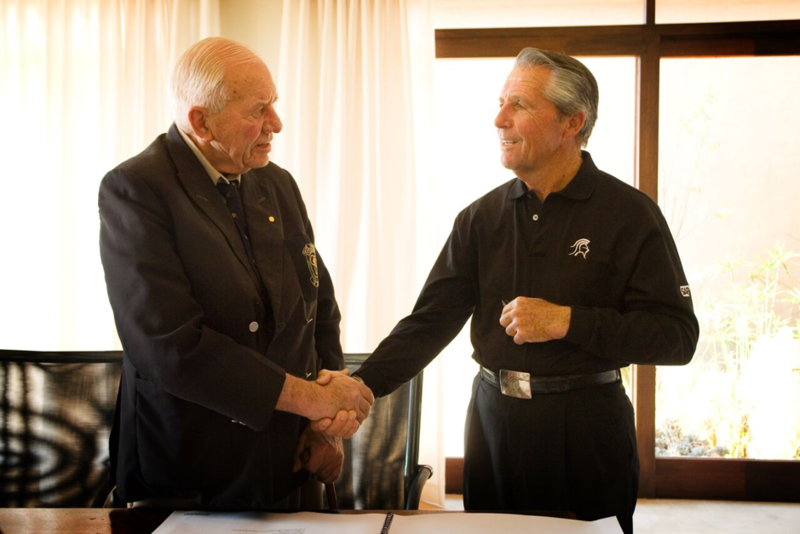 In a meeting that I had with Major General Johan Jooste of SANParks last year, he described the rhino poaching situation as an undeclared war. These two links certainly emphasise that point. 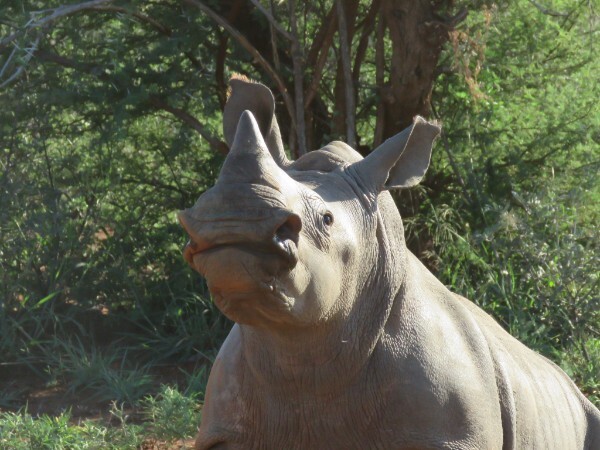 Another indicator as to why this poaching issue is so complex is the matter of corruption – please see this link where a highly decorated Game Ranger in the Kruger National Park was caught with a rhino that he had shot for its horn. It is tragic. Whilst official poaching statistics are no longer published for poaching within South Africa, indications are that the kill rate remains around 100 rhinos per month. What is most concerning is that the poachers seem to be spreading their path of destruction to more regions of South Africa beyond the Kruger National Park. Six rhinos were killed in one weekend last month in the Hluhluwe- Imfolozi Parks in Kwazulu Natal. The situation is desperate and it is also critically urgent that alternative strategies – such as The Australian Rhino Project – are implemented as soon as possible. This list is not sequential; all four pillars need to be addressed simultaneously. As we have mentioned before, the Australian Government’s biosecurity laws are understandably stringent and we have been and will continue to be responsive to and supportive of these requirements. To date we have provided comprehensive scientific detail to the Australian Department of Agriculture and Water Resources regarding rhinos and the risk of disease. We have also provided detailed information about the planned quarantine facility in South Africa. The Department of Agriculture and Water Resources is currently reviewing and assessing this detail at the time of sending out this newsletter. We are regularly asked about the ‘physical’ process to get the rhinos to Australia. Simplified, it goes like this. In South Africa – identify the rhinos, dart, capture, transport to the quarantine facility. In quarantine for a period to be determined by the Australian Department of Agriculture; transport to Johannesburg airport. Fly to Australia. In Australia – transport to the quarantine facility. In quarantine for a period to be determined by the Australian Department of Agriculture. You will understand that this really is a highly simplified description of the process – there is a huge amount of planning, paperwork and compliance to go through for each step. So, in summary, we continue to work daily on planning a future for rhinos in the safe haven of Australia and are currently working with the Department of Agriculture and Water Resources as to the next steps. Buy an item from our SHOP at www.theaustralianrhinoproject.org between now and the end of October and we will throw in a free pin valued at $10 with ANY order. No need to add it to your order - our magic elves will automatically include it in your despatch. Start your Christmas shopping early. The first African Elephant proposals (CoP 17 Proposals 14 & 15) were made by Zimbabwe and Namibia and sought the removal of annotations to the Appendix II listing so as to allow Zimbabwe and Namibia to trade in ivory. The proposals were rejected in a secret ballot. The next proposal by northern African nations (CoP17 Proposal 16) sought to place all African Elephants on Appendix I. It was rejected in an open vote. 62 nations voted for the up-listing, 12 abstained and 72 were against (including the EU and U.S.). Swaziland made a proposal to (CoP17 Proposal 7) to alter annotations to Appendix II listing of Swaziland's White Rhino so as to allow regulated trade in horn collected from natural deaths, seizures and non-lethal harvest. It was rejected (100 voted no, 17 abstained, 27 voted for the proposal). A big thank you to everyone for your support for World Rhino Day. 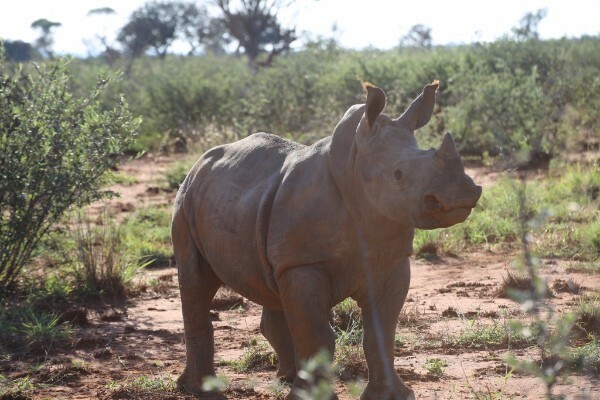 We managed to connect with over 200,000 people during the month of September and share the story of the plight of the world's rhinos. 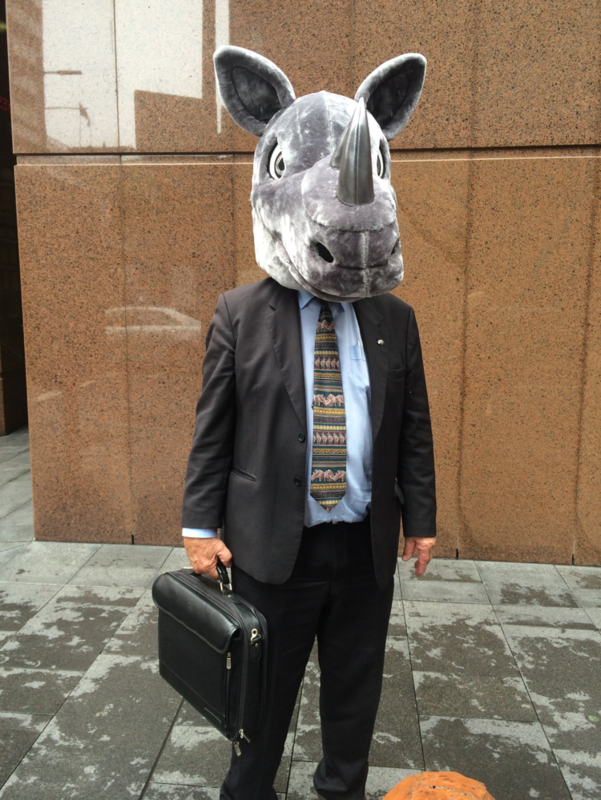 One of the key highlights was our World Rhino Day display in Martin Place, Sydney. Many people came and asked us questions about the project, made donations and purchased hats. Special thanks to Investec for their support with the event and our friends at Plum Play for helping with the display and donating a business card draw prize. 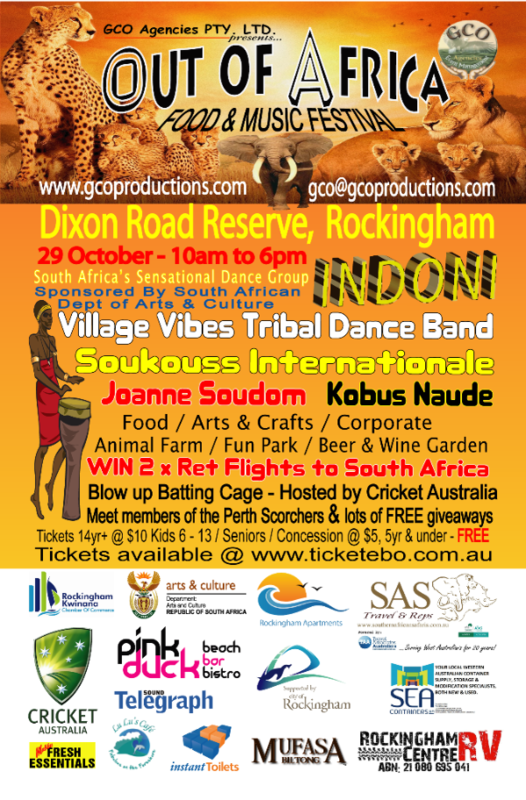 The inaugural Out Of Africa Festival will take place in Rockingham in Perth from 10am - 6pm on the 29th October. The festival will include stalls of African food, African drumming and dancing demonstrations including International Dance Academy group- INDONI. Plus Perth based African bands, Village Vibes Tribal Dance Band & Soukouss Internationale!! The 3 Bay Challenge was created by one of our Young Rhinos, Vincent Stander, as an annual event that was a biathlon where everyone is welcome. Over the past 3 years, the event has attracted participants from professional athletes to corporate teams to families. 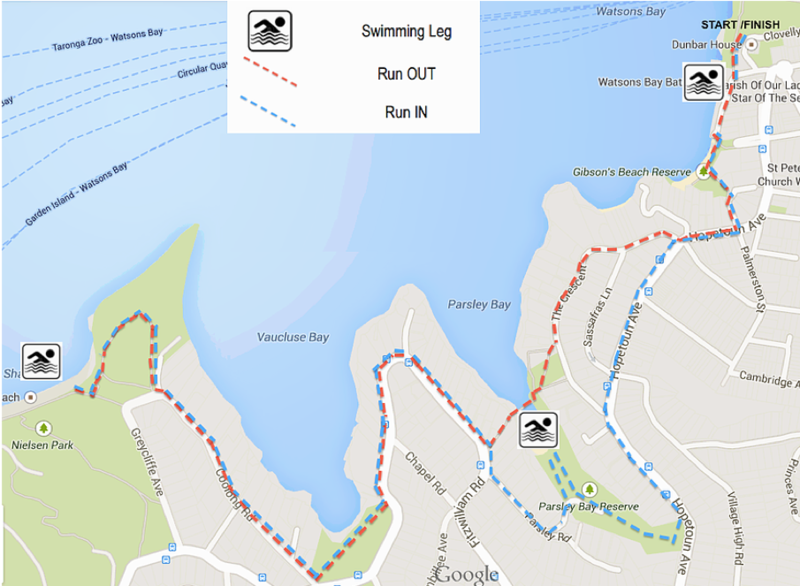 The 3 Bay Challenge is a three stage biathlon where participants run and swim at three of Sydney's iconic harbour beaches: Nielsen Park, Parsley Bay, Watsons Bay. The course comprises three running legs and three swimming legs. Total distance is a 6km run and 750m swims. Marshalls and lifeguards are on the course at all times. The event is designed to be challenging, unique and also good fun set in an idyllic location with the backdrop of the Sydney CBD. After successfully competing in the 3 Bay Challenge, the tradition is to all meet at the Watson’s Bay Hotel for a celebratory drink and bite to eat. Registration fee includes one drink and food item. The 3 Bay Challenge is a perfect weekend challenge for professionals, biathlon enthusiasts and those competing for the first time. ​Register today and take the challenge with us on Sunday 13th November. Tickets: $40 per person, all proceeds go to the Australian Rhino Project. All funds raised from the 3 Bay Challenge go directly to The Australian Rhino Project. Places are still available for this nine day safari to South Africa escorted by Ray Dearlove. This is your chance to travel with Ray to witness first hand the struggle for Rhino conservation in South Africa. The safari will visit two unique eco‐systems all with established rhino conservation projects underway. 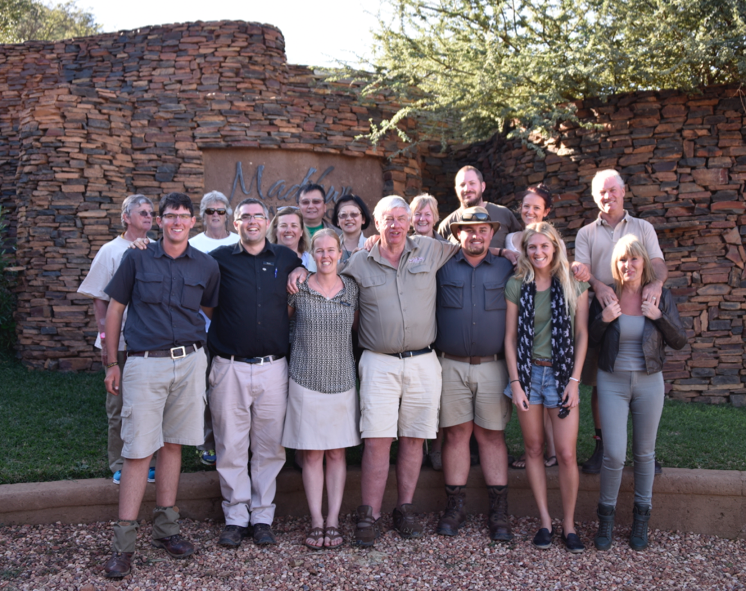 You will meet and spend time with some of the leaders in the field of rhino conservation. The journey aims to provide you with an insight into what the real conservation issues are, how they are being tackled, how the Rhino are being protected and the commitment required in order to save the species from extinction. It is also a fabulous safari with plenty of game viewing activities and will appeal to both ﬁrst‐time travellers to Africa, or those who have a deeper interest in the wildlife. 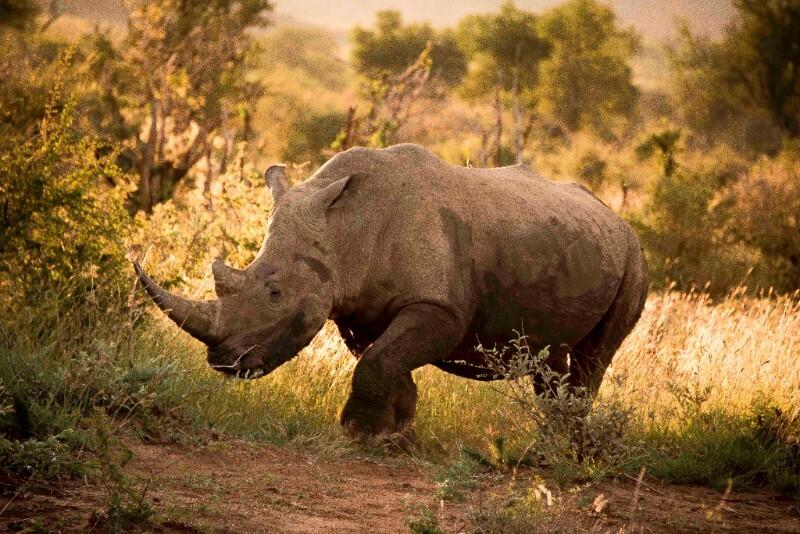 The safari will provide you with access to rhino experiences that are not available to the general public.